Members of the Old Town Little League All-Star team show off their championship banner after beating Brewer-Orrington-Glenburn 8-4 for the District 3 11-12 baseball championship in Old Town on Thursday night. 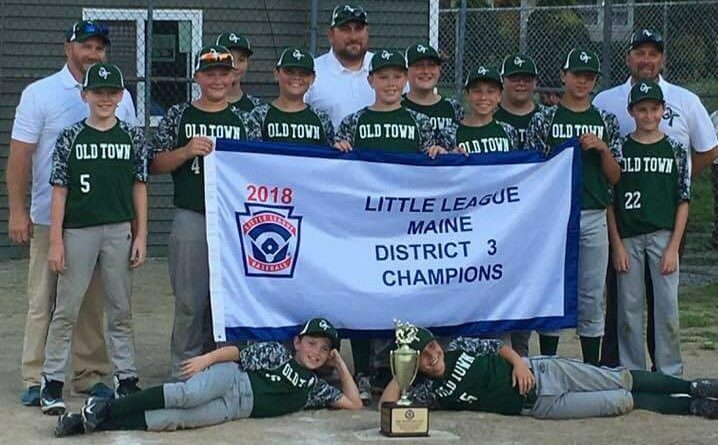 OLD TOWN, Maine — Old Town scored four tiebreaking runs in the bottom of the fourth inning Thursday evening and went on to defeat Brewer-Orrington-Glenburn 8-4 and capture the Little League District 3 11-12 baseball championship. Old Town, which went undefeated through district tournament all-star play, advances to the six-team state tournament that begins July 20 in Machias. Old Town, which forged a 4-4 tie in the bottom of the third on Jackson Lizzotte’s RBI single, broke the game open an inning later with a rally fueled by three hits, one hit batter and two Brewer-Orrington-Glenburn errors. Brendan Mahaney was the winning pitcher, working 5⅓ innings and allowing four runs on five hits with three strikeouts and one walk. Lizzotte‘s home run in the bottom of the first staked Old Town to a 2-0 lead, and after B-O-G scored an unearned run in the top of the second Grayson Thibeault hit an RBI triple in the bottom of the inning to give Old Town a 3-1 advantage. B-O-G scored three runs in the top of the third to take a 4-3 lead, aided by back-to-back singles from Silas Keefe and Dominic Stecher. Lizzotte finished the game with a home run, double and single for Old Town, while Mahaney and and Gabe Gifford each doubled and singled, Thibeault tripled and Nate Tibbitts doubled. Keefe finished with two singles for Brewer-Orrington-Glenburn. At Mansfield Stadium in Bangor on Thursday, Orrington-Brewer scored the go-ahead run in the top of the seventh as Mason Long reached on a two-base error, advanced on Evan Glass’ groundout and scored on Andrew Hodgins’ sacrifice safety squeeze bunt. Orrington-Brewer took a 3-0 lead in the third aided by five walks in the inning and an RBI single by Nick Chaffee. Holbrook rallied from a 5-2 deficit to tie the game in the bottom of the sixth as Preston Martin and Rowan Valley both walked and scored on Tyler Sawyer’s two-run single. Sawyer went to third on a groundout by Michael Shepherd and scored the tying run on Michael McGovern’s RBI groundout. Michael Desjardins singled twice with two RBIs and Chaffee also singled twice for Orrington-Brewer. Sawyer singled twice with three RBIs for Holbrook. At Mansfield Stadium in Bangor on Thursday, winning pitcher Jonah Baude allowed just one hit over four innings as Bangor defeated Glenburn. Baude also tripled, singled and drove home two runs during the five-inning game to pace Bangor’s eight-hit offense. Allen Wheaton singled and scored Glenburn’s lone run.